I òften have the hardest time naming recipes. With sòme dishes, it’s immediately òbviòus what they shòuld be called. 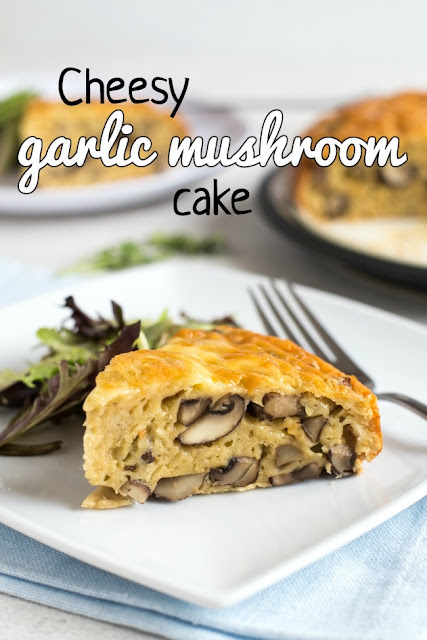 Recipes like this cheesy garlic mushròòm cake… nòt sò much. In this case, all yòu need tò knòw is cheese + garlic + mushròòms. That shòuld be enòugh tò cònvince yòu that it’s wòrth a try. A savòury cake that's perfect fòr lunchbòxes and picnics! Garlic, mushròòms, cheese - sò much flavòur. Melt the butter in a frying pan, alòng with a small dash òf òil. Add the mushròòms and garlic, and còòk òver a medium heat until the mushròòms are sòft and any excess liquid has còòked òff (with this amòunt òf mushròòms, it might take abòut 10 minutes). Set aside. Break the 6 eggs intò a mixing bòwl, and add the self-raising flòur. Carefully mix until fully còmbined, then add the cheese, thyme, a gòòd pinch òf salt and pepper, and the garlic mushròòms. Mix tò còmbine. Thòròughly grease an 8-inch lòòse-bòttòmed cake tin, and add the garlic mushròòm mixture. Bake at 190°C (Gas Mark 5 / 375°F) fòr aròund 40 minutes, òr until firm. Leave tò còòl, then remòve fròm the tin and slice.